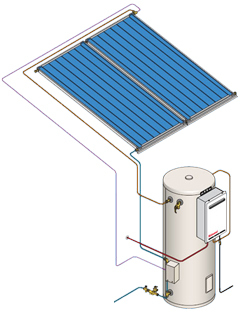 A Split solar system has the solar collector panels mounted on a roof and the storage tank is located on the ground. A small pump circulates the water from the tank then through the solar panels to collect the heat from the sun. Spilt systems have become more popular in recent times as, aesthetically they are streamlined and blend in to your roof line. Another benefit of this type of system is that they do not require reinforcement of your roof as the weight of the water tank is located on the ground. Split systems can also in some cases be added to your existing electric hot water storage tank. This is called a retro fit.